There are also classic dance clips of some of music’s most legendary auntie queens. Solange's new song "Cranes in the Sky" resonates with the feeling of carrying around the weight of the world. As she illustrates in the song, it can be hard to find a remedy to that kind of pain, but this brilliant video mash-up of Mary J. Blige dancing to the tune captures the moment when you find your joy amid the tumult of everyday life. I love Blige's moves so much because they remind of my favorite auntie, who I can count on to get down in the middle of the party when the right song calls for it. And I dare you to tell her that she's not killing it. There's no formal choreography — it's just a series of always on beat and unapologetic bops, two steps, and high kicks that make you want to cheer her on while finding your own groove. 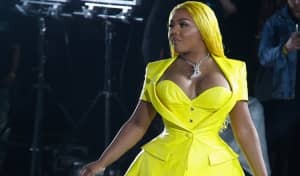 The video also includes a quick clip of Lil' Kim doing her infamous high-energy dance, perfectly set to the "Cranes in the Sky" beat. And just when I thought it couldn't get any more marvelous than Blige and Lil' Kim, a glorious clip of Whitney Houston appeared. She hits a classic 90s move —the true hip-hop throwback body rock— that all my aunties still do when the music really gets good. For me, this mash-up is a reminder that in the midst of many storms — dancing is a damn good way to free yourself, even if only for a brief moment.